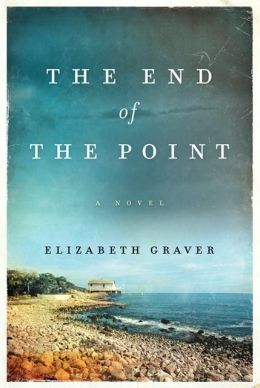 Elizabeth Graver’s fourth novel, The End of the Point, is an old-fashioned family saga told in a very modern way. Using the wealthy and privileged Porter family as her focus, she examines the issues, events, and massive changes of the second half of the 20th century. It is as if Graver were a photographer, alternating between a close-up lens for portraits of the Porters and a wide-angle lens for landscape shots of the “American century.” Her approach is not that of John Steinbeck in The Grapes of Wrath, in which he alternated chapters on the Joad family and the “Great Migration” from the Midwest to California during the Depression. Instead, she has seamlessly blended the two; she has done it so effectively that the reader rarely senses the lenses being changed or the focus being altered. The result is a study of one family’s domestic dramas against the backdrop of one of the most dynamic 50-year periods in history. The Porters are from New Jersey but The End of the Point concerns itself with their time at their retreat on the fictional Ashaunt Point, on Buzzards Bay in Massachusetts. Starting in 1942, we meet the aristocratic mother, Mrs. P; teenage daughters Helen and Dossy, and eight-year-old Jane; son Charlie; and the children’s nurses, Bea and Agnes. The first section of the book, “Janes All the World’s Fighting Ships and Aircraft, 1942,” is told through the eyes of Bea, a modest and charming Scottish immigrant who has become the real mother to Janie. The American military has taken over part of the Point in order to keep watch on the Atlantic, and the older girls and Bea develop relationships with soldiers. As if to pull in her readers with the most accessible strand of the plot, Graver has Bea reluctantly fall in love with the archetypal American nice guy, “Smitty.” But Graver’s resolution of this subplot sends a message to her readers by the end of this section (on page 111) that The End of the Point is not a soggy saga or a beach read. She is interested in more serious matters and intends to dig deeper. We soon learn that Ashaunt is a special place to all who know it, but especially to the Porter family, who spend summers and most holidays and vacations there. Graver does a nice job of describing the narrow peninsula, the handful of vacation homes, the flora and fauna, and the stark beauty of the bay. As the book proceeds, Ashaunt Point and the Porter summer home do establish themselves as additional characters, both of which are a constant presence in the family’s life. Late in the book, Graver writes, “…[T]he garden follows her, a dreamscape unspooling, brighter than the wildflowers and the white-pink roses grown spindly on her own trellises; brighter too than her own walled garden, bee balm blooming now, asters on the verge, the lupine (over) with its fuzzy, blackened rattle pods that could be cracked for seeds to nick, soak, plant” (p. 282). I haven’t read many sentences lovelier than that; it begs to be read aloud so you can chew on those soft consonants and varied vowels. The next section of the book, “Plants and Their Children, 1947-1961,” focuses on Helen and her family in the Baby Boom years, most particularly her complicated relationship with oldest child Charlie, named for her brother, a fighter pilot shot down during the war. We follow young Helen though letters sent home from Europe, as she attends college, marries, and raises her children (Charlie, Will, Caroline, and Percy). Helen is obviously brilliant and driven, but also demanding and self-absorbed. She is particularly hard on her oldest son, Charlie, who is gifted but not as steely as his mother. (This plot strand is explored in more detail in the next section of the book, which follows Charlie.) She struggles to balance her academic and intellectual goals with her desire to be a good wife and mother, but she never quite reconciles the two impulses. A letter written in 1960, when Helen is in her early 30s, encapsulates her dilemma. “Being here, I find myself more than ever two people instead of one. One longs to live day by day, for sparking driftwood fires, and closed doors, the wildness of my fall garden, harvesting vegetables to boil on the stove. The children. To keep them young. To keep them from the world and all its pain and disharmony. When I am in that state, I can imagine abandoning all ambition and just living inside all this beauty. And yet it is never enough, for I also long to study, to create something lasting in words, to achieve things that the world will recognize as unusual and distinguished and escape in complete absorption into something outside myself. To talk with others about things that matter and go for Truth” (p. 134). Graver captures the conflict well. “Was he a weak son, too subject to her will? Was she a bad mother? She could have been much worse. Did she love him? Of course. Too much, he thought. She did not pressure his brothers, not like that, and though she pressured Caroline, it was in a different way — to be her soulmate, to write poetry and pour her thoughts out, except that midway through, his mother would grow distracted or turn on his sister, rageful or diminishing, or — worse — just walk away” (p. 232). Only later does Charlie begin to find relief. “Smaller and smaller, Charlie grew after that; it was how he pictured it later, his body and brain pressed to one side, sidestepping, until one moment — well into his twenties, closer to his thirties — when he felt his mother’s gaze diminish, her hopes slacken — and began, cautiously, to venture forth again” (pp. 231-232). But it’s not just a stock demanding mother-destroys-sensitive son melodrama. Charlie’s brief experimentation with hallucinogens as a college freshman has exacerbated his psychological and emotional problems, significantly complicating his relationships with his mother and the rest of his extended family, to say nothing of his relationship to the outside world Graver does an admirable job in realistically detailing mental illness, which runs from Helen’s sister Dossy to Charlie and beyond. “He knew how a mind could buckle; he’d seen it in the patients at the hospital in Cleveland, seen it in Dossy, the way reality could bend and stretch, accommodate almost anything — and then his aunt would go away for a while and return, talkative and funny, painting her paintings, writing her poems, all the while carrying this thing around with her, this dark possibility veined with gold. He knew firsthand how the ceiling could sink down, your sightline travel through an object, halos appear, the self disappear, becoming approximate, proximate, turned away from itself in parallel play. He’d seen the madness, tracked it in its various forms” (p. 243). Contemporary problems threaten life on Ashaunt Point when a developer wants to build vacation homes on neighboring land that wealthy friends have sold. At the same time, Charlie warily befriends Jerry, a Vietnam vet who appears to be homeless and who alternates between fiery brilliance and madness. Only later do we learn that he is living proof of the damage caused by the use of Agent Orange as a jungle defoliant. Despite the shifting narrative perspectives (Bea, Helen, Charlie), we never lose track of the other characters, particularly Bea and Jane. And Ashaunt remains omnipresent, whether the characters are actually there or not. Late in the novel, a young woman who has become part of the Porter family observes, “Never before, Rachel told him, had she witnessed the way a place could become a person, a person a place, but as she’d walked the labyrinth of paths he’d made, she’d felt as if she were walking the folds of his beautiful (damaged) brain” (p. 295). In The End of the Point, Graver has given us an intimate view of the members of one family coping with the challenges they present each other and those presented by the outside world. They live the way all of us do: in our own little world, both imposed on us and created by us, and in the greater world. Like the Porters, we too struggle to make sense of the people and problems both worlds present. This is not an easy or a fast read, although the pace picks up as the story progresses. It is a family saga elevated to literature by the quality of Graver’s insights into multiple characters and by the quality of her prose, which is complex but rewarding. (A problem early in the book with an overabundance of parenthetical explanations that clutter up the sentences, soon resolves itself.) Readers looking for a beach or airplane read might find The End of the Point a bit too dark or complicated and not sufficiently maudlin. But those seeking a measured and thought-provoking read are likely to enjoy spending some time at the end of the point.